It’s been a wild ride for Faast these past few months. We’ve gone from being unheard of a mere 6 months ago to listing well over 100 cryptocurrencies, rapidly gaining users month after month, and building partnerships with established names in the industry, as well as bright new startups eager to make an impact. 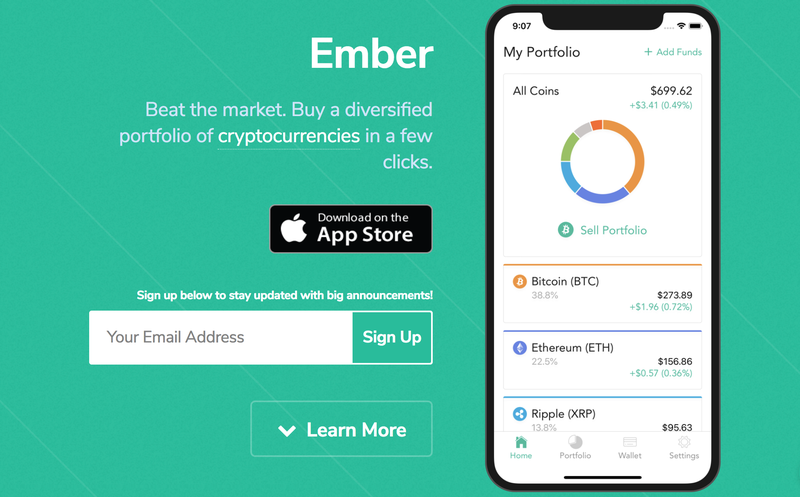 Today we’re proud to announce our integration with Ember, a new app that allows you to easily build a diversified crypto portfolio with just a few clicks. If you’ve ever felt that trying to keep track of the market performance of individual cryptocurrencies can be a real pain, you’re not alone. With the stock market, you can pick individual stocks if you want, but many people don’t have the time or inclination to follow what’s happening in the market that closely. They have real lives, jobs and families to worry about — how are they supposed to compete against professional day traders? It’s the same thing with the cryptocurrency world: many people want to get in on the action, but don’t want to get caught up in the daily drama of price fluctuations and industry news. They just want to build a healthy, diversified portfolio. For stocks, index funds offer a potential solution to this problem. In the midst of the massive bull market of 2017, it was clear that keeping up with rapid price swings required more time and energy than most people had. 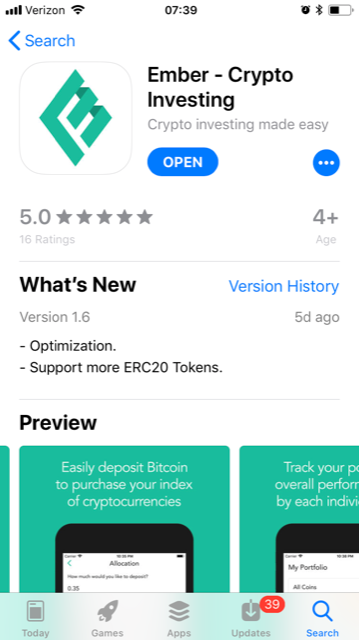 So when Ember co-founder Alex Wang tried to find a crypto index fund for ordinary people, imagine his surprise when nothing of the sort existed at the time. That’s when Alex and his friends got to work building Ember, the first simple crypto index fund app that allows you to “beat the market” by building a diversified cryptocurrency portfolio in seconds. Like Faast, Ember is a non-custodial product, meaning that there is no point at which they take custody of your crypto holdings like a centralized exchange does. Instead, EmberFund generates wallets with client-side encryption that prevents them from having any access to your assets. Your funds stay on the blockchain instead of their servers. 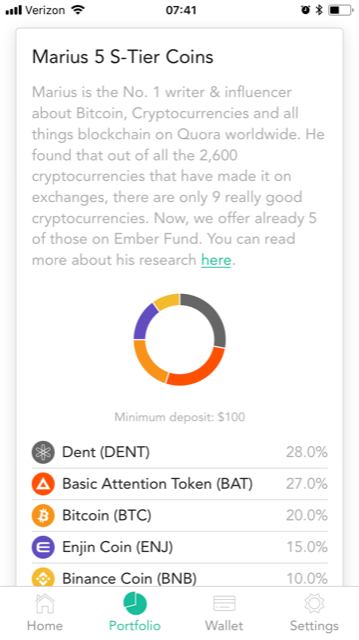 Just like Faast, there is no way Ember Fund could take your money even if they wanted to. It simply isn’t possible. Creating an account is as simple as downloading the app from the App Store and entering your email address to create an account. When you make your account, a wallet is created for you. You only need to remember your email address, password, and 4-digit PIN. This dramatically simplifies the process of wallet management, which normally requires you to save or write down a long private key which is almost impossible to remember. You can fund your Ember wallet with as little as $100 USD in BTC from Coinbase or your own wallet. Once your wallet is funded you can select from various crypto portfolios the Ember Fund team has put together, such as the “Ember 6” or “Big 3”, both of which are available as balanced or weighted funds. The newest portfolio option is the Marius, which expands EmberFund’s offering to include altcoins like Basic Attention Token (BAT), Dentacoin (DENT), Binance Coin (BNB) and Enjin Coin (ENJ) — all powered by Faast. The Marius Portfolio, inspired by the eponymous top-rated crypto writer on Quora. You can also create a customized portfolio and allocate funds however you like. The release of Ember marks a huge step forward in making cryptocurrency investing simpler and more accessible to millions of ordinary people, and we couldn’t be happier to help power the cryptocurrency transactions that allow you to build your portfolio almost instantly with this product. Together, Ember Fund and Faast are building a new, more inclusive world for cryptocurrency investing. Check it out for yourself today!